Paris Gare d'Austerlitz . . . The Gare d'Austerlitz is one of the main Paris termini. I say main, but it's a shadow of its former self, it now just handles intercité trains on the classic route from Paris to Limoges, Cahors, Brive & Toulouse, the few remaining intercité de nuit overnight trains to Latour de Carol, Toulouse, Briancon & Perpignan, and regional trains to Orleans, Blois & the Loire Valley. The Gare d'Austerlitz was once the grand terminus of the Paris-Bordeaux railway, handling express trains to Bordeaux, Biarritz & Lourdes, plus the sleeper trains to Spain and even at one time the Sud Express to Portugal. However, mainline trains to southwest France switched to using Paris Gare Montparnasse when the TGV Atlantique high-speed line opened in 1989-90, and the sleepers to Spain were discontinued in 2013. The Gare d'Austerlitz has been a dead-end terminus for decades, but it was built as a through station, obvious when you look at its layout. Until 1939, trains used to continue along the banks of the River Seine to the Gare d'Orsay and beyond. However, the suburban RER trains now run in tunnels underground, the Gare d'Orsay is now a famous Parisian art museum, and the Gare d'Austerlitz is now a terminus. Indeed, the buffer stops have recently been moved even further east and new platform canopies are under construction. At the time I write this the huge original arched trainshed is a construction site, sealed off from the public. 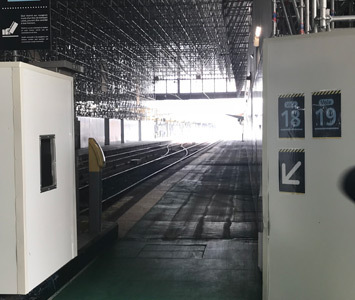 Platforms are numbered 1 to 21 from left to right as you look at them, starting with platform 1 on the north side. The main station building with the main hall and ticket office is on the north side facing the Seine, although if you arrive by metro or taxi you may end up entering from the roadway on the north side. You can find a detailed plan of the station and its facilities at www.gares-sncf.com. The north side of station. This is the main station building, facing the river Seine. This side of the station is pedestrianised, with steps and a slope leading up to the road that runs along the left bank of the Seine. ...the platforms are currently a construction site. The south side of the station. The taxi rank and entrance to the station are at the far end of this roadway. The exit to the street is behind the camera. Note the bridge carrying metro line M5 into the metro platforms, which are actually built into the upper levels of the mainline station! Line M5 climbs up from underground just north of the Seine, crosses the river on a bridge to arrive at the above-ground Gare d'Austerlitz metro station. The north side of the station again, with the bridge over the River Seine on my right. Taken from the same spot as the previous photo, but looking the other way, across the bridge over the River Seine with the Gare d'Austerlitz behind the camera. You can see the clock tower of the Gare de Lyon on the other side of the river. You can see how close the Gare de Lyon and Gare d'Austerlitz are. There's very little in the way of restaurants or eateries at the Gare d'Austerlitz or even immediately outside, so consider eating at the celebrated Train Bleu restaurant inside the Gare de Lyon on the other side of the Seine, this is an experience in itself. Then stroll 10 minutes over the bridge across the river Seine to the Gare d'Austerlitz to catch your train. Dinner at the Train Bleu restaurant before taking an overnight train to the south is a great idea! There are various small food kiosks at the Gare d'Austerlitz, although there are no major supermarkets nearby. There's a large Monoprix supermarket near the Gare de Lyon on the other side of the river. Left luggage lockers... The Gare d'Austerlitz has luggage lockers if you want to leave your bags for a few hours or a day, see the luggage lockers page for details. Taxis... There's a taxi rank on the north side of the station with plenty of taxis. See Paris taxi advice. Metro... See the Crossing Paris by metro page for metro advice. Metro line M5 links Paris Nord & Paris Est directly with the Gare d'Austerlitz. The Paris metro & bus website is www.ratp.fr. Hotels... If you need to stop overnight, there are very few hotels immediately near the Gare d'Austerlitz, but plenty on the other side of the river near the Gare de Lyon. 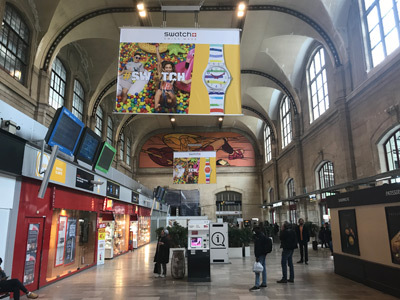 The 4-star Mercure Paris Gare de Lyon is on the Gare de Lyon station forecourt next to the station clock tower, the 3-star Hotel Terminus Lyon is right in front of the Gare de Lyon, the Novotel Paris Gare de Lyon is opposite the station. Or try the Mistral Hotel 800m from Gare de Lyon, or the 2-star Hotel de Reims 5 minutes walk from Gare de Lyon.